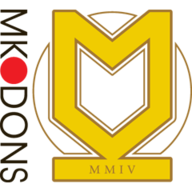 MK Dons booked an FA Cup second-round grudge match with AFC Wimbledon after winning 6-1 at home to non-league Cambridge City. Two goals from Shaun Williams in Tuesday night's replay, combined with efforts from James O'Shea, Dean Bowditch, Dele Ali and Adam Chicksen, set up a first-ever clash with the Dons' London namesakes at stadium:mk; Dave Theobald netted City's consolation. The Dons controlled the first half, and Williams scored a brilliant goal to break the deadlock after 12 minutes, lobbing keeper Zac Barrett with a dipping left-foot drive from 40 yards. Ryan Lowe had a shot cleared off the line by Lee Chaffey and O'Shea hit the crossbar before doubling the lead two minutes prior to the break, jinking into the box to curl the ball past Barrett. Bowditch then made it 3-0 on the stroke of half-time, firing home from a tight angle after Barrett had parried Lowe's fierce shot. Theobald nodded in Luke Allen's cross from close range on the hour mark to give Cambridge hope but Williams' penalty, Ali's 25-yard screamer and substitute Chicksen's solo goal sealed the rout.